In this DIY, we are going to make an IOT based dumpster/garbage Monitoring System which will tell us that whether the trash can is empty or full through the webserver and you can know the status of your ‘Trash Can’ or 'Dumpsters' from anywhere in the world over the Internet. It will be very useful and can be installed in the Trash Cans at public places as well as at home. 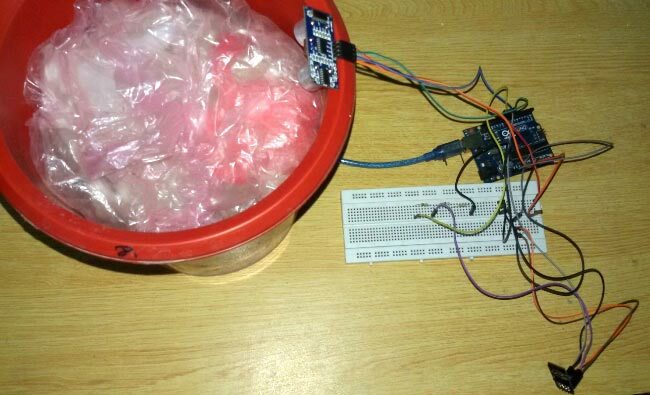 In this IOT Project, an Ultrasonic Sensor is used for detecting whether the trash can is filled with garbage or not. Here Ultrasonic Sensor is installed at the top of Trash Can and will measure the distance of garbage from the top of Trash can and we can set a threshold value according to the size of trash can. If the distance will be less than this threshold value, means that the Trash can is full of garbage and we will print the message “Basket is Full” on the webpage and if the distance will be more than this threshold value, then we will print the message “Basket is Empty”. Here we have set the Threshold value of 5cm in the Program code. We will use ESP8266 Wi-Fi module for connecting the Arduino to the webserver. Here we have used Local webserver to demonstrate the working of this Garbage Monitoring System. The ultrasonic sensor has four pins. Two are VCC and GND which will be connected to the 5V and the GND of the Arduino while the other two pins are Trig and Echo pins which will be connected to any digital pins of the Arduino. The trig pin will send the signal and the Echo pin will be used to receive the signal. To generate an ultrasound signal, you will have to make the Trig pin high for about 10us which will send a 8 cycle sonic burst at the speed of sound and after striking the object, it will be received by the Echo pin. ESP8266 is a Wi-Fi module which will give your projects access to Wi-Fi or internet. It is a very cheap device but it will make your projects very powerful. It can communicate with any microcontroller and make the projects wireless. It is in the list of most leading devices in the IOT platform. It runs on 3.3V and if you will give it 5V then it will get damage. The ESP8266 has 8 pins; the VCC and CH-PD will be connected to the 3.3V to enable the wifi. The TX and RX pins will be responsible for the communication of ESP8266 with the Arduino. The RX pin works on 3.3V so you will have to make a voltage divider for it as we made in our project. First of all we will connect the ESP8266 with the Arduino. ESP8266 runs on 3.3V and if you will give it 5V from the Arduino then it won’t work properly and it may get damage. Connect the VCC and the CH_PD to the 3.3V pin of Arduino. The RX pin of ESP8266 works on 3.3V and it will not communicate with the Arduino when we will connect it directly to the Arduino. So, we will have to make a voltage divider for it. Three 1k resistors connected in series will do the work for us. Connect the RX to the pin 11 of the Arduino through the resistors as shown in the figure below and also the TX of the Arduino to the pin 10 of the Arduino. Now it’s time to connect the HC-SR04 ultrasonic sensor with the Arduino. Connections of the ultrasonic sensor with the Arduino are very simple. Connect the VCC and the ground of the ultrasonic sensor to the 5V and the ground of the Arduino. Then connect the TRIG and ECHO pin of ultrasonic sensor to the pin 8 and 9 of the Arduino respectively. Before uploading the code, make sure that you are connected to the Wi-Fi of your ESP8266 device. You can check the full code in Code section below, code has been well explained by the comments, further we have also explained some important functions below. The Arduino will first read the Ultrasonic Sensor. It will send a ultrasonic signal at the speed of sound when we will make the TRIG pin high for 10us. The signal will comeback after striking the object and we will store the travel time duration in the variable named duration. Then we will calculate the distance of object (garbage in our case) by applying a formula and will store it in the variable named distance. For printing the output on the webpage in web browser, we will have to use HTML programming. So, we have created a string named webpage and stored the output in it. To tell whether the trash can is empty or not, we have applied a condition there. If the distance will be less than 5cm then it will show “Basket is Full” on the webpage and if the distance will be greater than 5cm then it will show the message “Basket is Empty” on webpage. The following code will send and show the data on the webpage. The data, we stored in string named ‘webpage’, will be saved in string named ‘command’. The ESP8266 will then read the character one by one from the ‘command’ and will print it on the webpage. After uploading the code, open the Serial Monitor and it will show you an IP address as shown below. Type this IP address in your browser, it will show you the output as shown below. You will have to refresh the page again if you want to see again that the trash can is empty or not. So this how this Garbage Monitoring System works, this project can be further enhanced by adding few more features in it like we can set one more message when the Trash Can is half filled or we can trigger a Email/SMS to alert the user when Trash Basket is full. Change the baud rate. Your esp8266 may have different baud rate. Check your TX and RX are connected to right pins and if it is still not running then try to power esp8266 from other source . how can we power esp from other source? If I compile the code it shows.. Send data is not declared in this scope..how to verify it. can i add two ultra sonic sensor. and can i get the two bins status on web server ?????????? should the wifi module be separately programmed ? First i tested my esp8266 module,it is working but when i run the above program as per given instructions,Iam not seeing anything in the serial monitor.Please help me with this. Good work. just want to ask, I want to fetch that result into an android app. Is it possible? i mean , that generated IP, is it static? if so, then i can easily fetch that IP into my app code. and then can display the result. You can set ESP8266 module for using static IP with AT command like that: AT+CIPSTA="IP_address","Gateway","subnet_mask" or AT+CIPSTA="192.168.1.120","192.168.1.1","255.255.255.0". ESP8266 remembers the last settings so the IP will remain static. ESP8266 module is not able to connect with internet as it is showing me "limited". It will be less than INR 1000, including all components and Arduino. Any idea how to connect this to a thingspeak channel? You should upload that through an API key. Use the api key for connections. when doing this project while I connect my wifi module to 3.3v pin in Arduino it shows the port error. Like "error opening serial port 'COM3'". how many times I changed the port it is showing like that. When I remove the wifi module 3.3V pin from Arduino it shows me to port and I can upload all the codes. how to connect to the wifi of esp8266? when i upload this code and connect other wifi module and sensor with arduino board . Its not display serial monitor and 192.168.4.1. this server is not working.. what can i do now.. please help. after uploading the code in the Arduino there is nothing will appear in the serial monitor.how can i refer whether it is working or not. If serial monitor shows nothing it means you have not connected the circuit properly. Use a multimeter to check for voltage levels. hey, I have ESP8266 NodeMCU in which there are many pins then what will be the ch_pd and Vcc in that? in short how I will connect the ESP8266 NodeMCU to Arduino now? please help. is it OK if I will add A 2 Ultrasonic sensor? We should upload code in arudiuno uno only ?? Or can we upload in esp8266 it will work or not ?? I burned the code at 115200 baud rate. Serial monitor is showing ip address and all but that ip address does not open in browser. Site cant be reached is shown. getting bad characters in serial monitor though have set the baudrate same as in the program. v r getting some junk characters what do we do?? nothing displayed on serial monitor...what to do?? This code is uploaded successfully but nothing shows in the serial monitor. What have to do? please help me..It's emergency. can change to reading counter or not ? From where I get all these equipment. Online or in shop.I am living in mumbai. hello!buddy serial monitor is not showing anything. I connected it the way u did. what to do? I follow the all the step and did the connection as per the diagram but ESP8266 is not visible to connect the lappy, what should I do? ?